Blackmer's HD943 and HDL943 compressors are designed for use in vapour recovery applications in the oil and gas market. Blackmer HD943 and HDL943 compressors have taken the concerns regarding vapour recovery and product contamination in oil and gas field applications into consideration by applying innovative distance piece design technology. The non-lubricated (oil-free) design of these compressors includes two distance piece compartments between the compressor’s cylinder and crankcase. External ports are located at the top and bottom of the distance piece chambers that can be used for purging, pressurising or venting. This provides the user with maximum leakage control of any vapours that would normally vent into the crankcase uncontrollably with other designs. It also allows for control of potentially harmful vapours to a recovery tank, safe disposal area or flare system before they can escape to the atmosphere. The compressors are also available with optional combinations of distance piece purging and venting, which add to their flexibility for even greater leakage control. 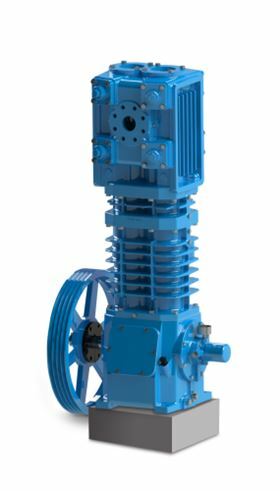 The HD943 and HDL943 compressors feature high-efficiency ductile-iron valves with PEEK valve plates, ductile-iron head and cylinders, three sets of self-adjusting filled PTFE packing sets on each piston rod for maximum leakage control, self-lubricating PTFE piston rings, a precision-ground crankshaft and a pressure-lubricated crankcase. The non-lubricated design means no lubricating oil is used in the upper cylinder or head area where it could add additional contaminate to the gas stream. Blackmer reports that these design features allow the compressors to provide maximum performance and reliability under the most severe service conditions. Blackmer, headquartered in Grand Rapids, Michigan, USA, is a global provider of rotary vane and centrifugal pump and reciprocating compressor technologies for the transfer of liquids and gasses. Blackmer is part of PSG®, a Dover company.